Monopoly Quiz of the Week | The Monopoly Nerd's Blog! The strategies, tactics, and math behind Monopoly. You are playing against two opponents and have all properties split up among the three of you, but none of you have a complete color group / monopoly and must therefore trade. You each have about 1100 (give or take a few bucks) in cash and are all coincidentally sitting on “GO”. After a lot of arguing, negotiating, and compromising, a most interesting choice has been reached. Each player will end up with one of the following color groups: magenta, red, or yellow. It just so happens that all other properties are mortgaged, but these are not. Assuming that you are able to convince your opponents to settle for any of the three aforementioned monopolies, which should you choose and why? What factors are the most sensitive to this decision? I look forward to your answers, and good luck! ** Now imagine the same scenario, except that the magenta properties are substituted with the light blues. How does this impact your decision and why? This entry was posted in Quizzes and Challenges and tagged Monopoly, monopoly quiz, monopoly test, monopoly tournament, Monopoly trading. Bookmark the permalink. First of all, the red is always worse than yellow. You don’t have to pay the property, so only the cost of development counts. And red development costs the same as yellow, but with worse rents. With $1100, you can buy 2 hotels on the magenta and 3 on the light blue. You can buy 7 houses on the red or yellow. Overall, in this quiz there will never be more than 12+7+7=26 houses on the board, so no housing shortage. Light blue is definitely the best. Magenta saves some money, but they won’t help if you land on the 3-house spots your opponents own…. it’s also relatively rare to end up on them (wrong side with respect to jail, only 1 step from to GO!, etc.). So I’d pick yellow. Hey Paolo! Thanks for your comment; clearly it was well constructed and thought out, which I always appreciate. That said, please double check your math/reasoning behind your answer for number of houses/hotels on the magenta group: houses there cost $100 each. Remember that the differential in houses between any pair of properties of the same color group may not exceed one, as per official Monopoly rules. Of course, I don’t think that the above correction would change your answer much, so I will proceed with addressing another point that you made. You have correctly noted that the cost of development is equivalent on the red and yellow color groups but that the revenue collected per hit is higher on the yellows. However, this added revenue is actually almost exactly offset by the greater probability of landing on a red space. See the below one-on-one analysis that I’ve done (using my simulator) between the reds and yellows (assuming the same amount of starting liquidity [x axis] and a “smart” building strategy by each player): the win percentage [y axis] differential is as close to a coin flip as it gets! Also, could you go into some explanation as to why you feel that light blue is best? I’d love to get your insights into the problem. Hi, I was confusing magenta with dark purple. Magenta is interesting because it lets you build 3 houses, which is where rents have a big jump. 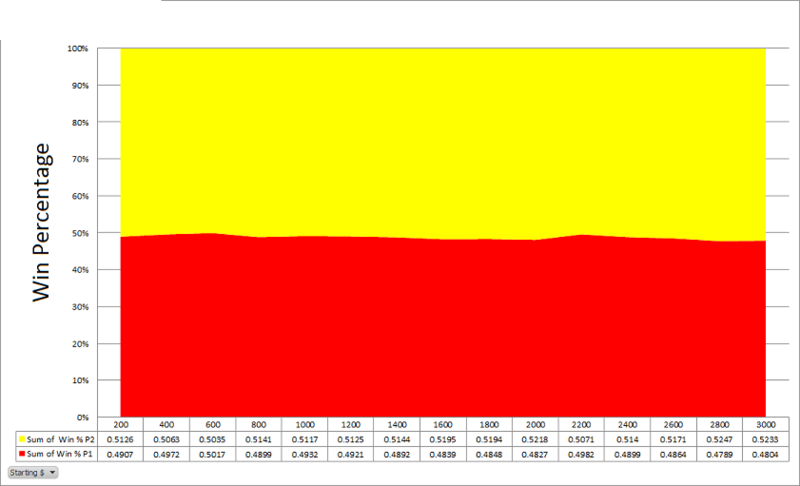 I would have guessed it to outperform yellow, but I would have been wrong (though by a small amount). As expected, however, orange outperforms magenta: even considering “go to St. Charles Place”, it costs the same to build, gives higher rent, and it’s easily reached from the jail. Even with this mistake corrected, I still prefer the light blue, and the simulator agrees. 🙂 You spend really a lot less money on building, and you have a pretty good chance that the opponent land on it on the first throw. Depending on the exact rules you use for the timing of construction activities (beginning of your turn vs beginning of everybody’s turn), this may impact their ability to build on the red or yellow. Does your simulator compute probabilities only for “Player 1 goes first, then 2, then 3”? Could you make it randomize that part as well? Ah ok…that makes sense about the color mixup. The simulator actually gives magenta the edge over red and yellow, but it is not as big as the edge afforded to light blue. Perhaps there are some slight differences in how you setup the position, which actually highlights one of the major points behind the simulator: there are many seemingly subtle factors in determining win percentages. Since my example has everyone starting on GO, the short-term probability of the two players without the light blues landing on the light blue squares before they have a chance to spend their 1100 dollars is quite high. Note that this is still the case when substituting the light blues with the magentas…but to a lesser extent. As you astutely mentioned, the magentas will still surpass the critical 3-house level with $1100, which really leaves short-term probability as the determining factor behind the difference in win percentage. I encourage you to play around with the starting squares, and you’ll notice a significant change in the win percentages (ie. put them all on Free Parking). Perhaps more than any other color group on the board, the win percentages of the owner of the light blues are particularly dependent on the opponents’ starting squares. – the official rules of Monopoly state that you may build at any time. Hi, could you contact me. I have a Monopoly eBook for sale on Amazon/Kindle, and would be happy to gift you a copy. If you like it, perhaps you could promote it on this site. It is here: http://www.amazon.com/Play-Monopoly-Still-Friends-ebook/dp/B00ACVX19O Please let me know. Great blog! Hey, just came across this blog, don’t know if you’re still updating, but I’m a fan of Monopoly too (and a fellow board-game blogger) and I thought I’d chime in. Mathematically I’m inclined to lean towards the yellows. They’ll give a better payout per house than reds, and the probability of landing isn’t so much lower that it would swing me. They’re an end-game monopoly, one that could deliver that final blow. But Monopoly is also about the given situation. At $1100 you can get to the 3rd house level (barely) for red or yellow, but be completely strapped for cash (7 houses * $150/house = 1050), with two monopolies ready to make you tear down. For the magentas you get your 3rd house on all of them 9 houses * $100/house = $900), greatly increasing the odds of tagging your opponents, with the added benefit that yours is the first monopoly they’ll pass. Either opponent takes that, and their monopoly will be crippled for the first go-around, easing your chances of getting counter-hit. I’d say take the magentas, build to 3 houses each, refrain from building the fourth to deal with a potential double rent hit from two houses ($200 + $450 rent – ($300 + $330 combined red and yellow rent) = $20), and hope to get a hit in. Alternatively I would consider taking the reds, hoping to dodge the magentas my first one or two rolls. I’m not a huge number cruncher, so probabilities vs. rent payout and likely scenarios I wouldn’t know (and I’m not factoring in turn order, though I think that’s not as relevant since houses can go up between turns), but I feel like it’s a big gamble. As for the light-blues, I’d avoid them. The situation is decent, but the probabilities of landing are not as great as I’d like, and if the game lasts much longer than these next few critical rolls you don’t have a great game-ending Monopoly. In that scenario I’d take my chances hopping over the blues and take the reds, hoping to get a hit before I get to yellow. I’m not sure whether you entered my proposed “Monopoly problem” into my simulator (http://pandora.dyndns.biz/monopoly), but you may be surprised to see that the light blues are the way to go. In this exaggerated scenario (all players starting at Go), the short-term probability of landing on the light blues overwhelms the long-term considerations that you have mentioned. While the blues’ knock-out potential pales in comparison as the amount of cash in the game increases (as you mentioned), in this case it’s all about getting that first hit in. If they all miss, then the situation changes of course, but remember that you have three players each with a 14/36 chance of landing on either Oriental, Vermont, or Connecticut before you even touch the dice! That’s just too high a percentage to pass up. Good, better than 50/50, but not as good as 77%. I look forward to any future blog entries you have! Instead it was a two-part question, each with three players. And in the part you addressed, the magentas of course are best. I encourage you to play around with positioning the tokens in various scenarios…it’s pretty remarkable what a difference board position can make. According to the simulator magenta 34.99%, red 31.78% and yellow 33.23%. Player 1 had the magenta, player 2 red and player 3 yellow all with smart aggressive. I set them up like this as I normally do as you go around the board from go. I personally (without knowing the simulator results) go with magenta, then red then yellow (even though yellow pays higher rent for the same cost of building) because the properties are likely to be hit in that order. When I replace magenta with light blue (and hyper for light blue) the light blue has the best chance of winning, 38.13% (with 30.56% for red and 31.31% for yellow). That’s only a small amount though but definitely if you were playing with a little less money then the light blues would be a lot better in this situation. If the other two players dodge the Magentas, the Magenta player is then faced with potentially having to evade an entire street – assuming both the Red and Yellow players place 2 houses each on their respective properties. There is a good chance the Magenta player will even land on the Reds and Yellows on consecutive turns. (The Reds are the second most landed on color group in the game, and the Yellows the third.) Moreover, even if the Magenta player is lucky enough to somehow dodge the Reds and Yellows, there is still the chance the player will land on the Go to Jail space, and have to go through the gamut, again, without having passed Go. Also, one of the other two could have to go to jail, as well – again, an ideal spot of evading the Magentas. I just don’t see the two other players landing on the Magentas on their first passes. At least one of them should probably miss. The “missing” player is now in the favorite, because the other guy (the Red or Yellow/ owner, who hit a Magenta property) is crippled, and probably cannot even afford to build one house on each of his three properties. So, the “missing” player just has to worry about the Magentas now. The “missing” owner is also now the favorite, because there is a great chance that either the Magenta or other player who just hit the Magenta will now hit one of his developed properties with two houses. The “missing” player, however, does have to worry about the “crippled” player going bankrupt on the Magenta player. Given the choice. I probably would take the Reds in this scenario – they are landed on more often, as a color group, than the Yellows. My analysis doesn’t change for the light blues. The light blues are the third least likely color group landed on during a game. I don’t feel both players will hit the light blues from the start, and, again, the “missing” player now becomes the “Strength” player. Before addressing your excellent points, I encourage you to enter this scenario into the simulator (http://pandora.dyndns.biz/monopoly). When assigning a hyper-aggressive building strategy to the owner of the magenta group (which more or less means that this player builds as much as possible as quickly as possible), he/she wins the game approximately 44% of the time (reds and yellows come in at about 29% and 27% respectively). Surprising, isn’t it? So what exactly is happening here? It boils down to two crucial factors: board position and maximum potential damage per dollar spent, both of which strongly favor the magenta color group at this moment. Your long-term analysis is, of course, spot on. If each player started with $11,000 in cash (as opposed to $1,100) and if the goal of the game were to maximize profits over the “long haul”, magentas would lose every time. Alas, that was the point of this quiz: to highlight the (often easily overlooked) importance of short-term factors when making trades. Specifically, board position and limited funds turn out to be crucial here…just as they are in many actual games. You are without a doubt correct in saying that the owner of the magenta properties would be in trouble if the other two players bypassed his/her color group. That said, the odds of both players missing the magentas before the owner of the magentas hits the reds or yellows is not very favorable. I’m really tempted to do some number crunching here; let me know if you’d like me to whip out the abacus. Your analysis of the “one opponent hits and one misses” scenario seems off to me, however. Let’s assume that the owner of the magentas goes “all out” and builds 11 houses and that the owner of the yellows lands on one of the properties with 4 houses ($625 on St. Charles for argument’s sake). The owner of the yellows now has $475 remaining, which means that he is effectively out of the game (this part we agree on). However, the owner of the reds is able to utilize her entire bankroll and builds a max of 7 houses (this is where the cash amounts come into play). Even in the worst-case scenario ($750 rent on Illinois), the owner of the magentas will still be able to maintain eight houses. More importantly, he remains in a dominating position AND has more than enough cash on hand to handle the more likely scenarios of either landing on a two-house red property or missing the group altogether. Overall, things are looking quite good for Mr. Magenta even if only one opponent lands on him. Things get better for the red and yellow owners when the third player gets a hold of the light blues (38% vs 31% vs 31%). In this case, it costs even less for the owner of the “lowly” blues to build hotels ($750 without breaking a sweat) and the short-term probabilities of being landed on go up. Considering their first rolls alone, the odds of at least one of the two opponents paying $550 or more is approximately 63% (2 * [14/36] – [14/36]*[14/36]). The drawback, however, is that the capped damage done leaves the other players more wiggle room to catch up and win. Hi! I am a teacher looking to incorporate monopoly scenarios into my counting and probability unit. I am willing to incorporate any probability concept to make this project work because I know the students will enjoy this! Brief overview of what I am looking at doing- Students get in groups of 4-5 people and choose a scenario from a created list (which I am hoping you all could help me create some fun scenarios that involve finding probability). Students explore the scenario by playing monopoly (replaying the scenario to collect data) students find probability of this scenario and then present their process and results to the class! Last day of project we will play monopoly 🙂 Please help me find/create some fun and creative scenarios so this project can happen! This is my first time teaching probability so I do not have many resources…. Emily, a simple one would be to do a dice probability exercise. Have one person situated on the visiting jail spot. Have the other person owning the orange set, and making a decision about where to build houses (they have $200 – enough to place a house on 2 of their monopoly, but not all three.) We know that the most common dice throw with 2 dice is 7 (16.67% chance) and the second most common is 6 and 8 (13.89%). Throwing a 9 has a 11.11% probability. So, the person if they have enough money to build 2 houses, should put them on the squares 6 and 8 spaces from Jail (since 7, the highest probability is a CHANCE square) There is a some nice 2 dice probability charts online – just search with Bing or Google, and have them make their decision based on the squares most likely to be landed on. This is a nice one. You can then take it a step further. Let’s say that you are within 12 spaces of your opponent’s houses/hotels, and they are within 12 of yours. If it’s their turn to roll, you have a choice: do you risk losing half of your liquidity by spending all of your cash to build more houses, or does it make more sense to hang onto your cash in case you land on your opponent when it’s your turn to roll? Just by placing the pieces at different squares, you can get completely different answers to these questions. There are really endless possibilities. Most probability exercises would be based off the dice, since that’s the one place where statistical probabilities influence the game. Where are you likely to land and when. This one’s a little more difficult (I haven’t done prob/stat in a long time, so I doubt I could answer it). Why is it a bad idea to play Monopoly with more than 4 players? One big reason is, the 5th player and on have a difficult time buying properties. With 4 players ahead of them, they’re more likely to land on previously purchased properties. Exploring this fully would delve into multiple turns, probability of doubles, etc. For a different exercise, have your students explore the prices of deeds and their corresponding rents. The current Monopoly iteration is the product of dozens of home-brewed editions and countless hours of playtesting. Why do deed prices increase at uniform $20 values for most of the board? Why do base rents move similarly, and what’s the return-on-investment of deeds at various housing levels? Could your students design a better deed cost structure? The chance and community chest cards are also a matter of chance.